"It holds my material steady,but lets me move it when I need to!" 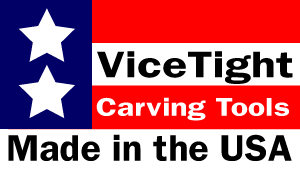 Designed for carvers by a carver! Our premier product, The ViceTight Carving Fixture (ON THE LEFT), is a simple yet sturdy device that fits standard 4" shop vises. 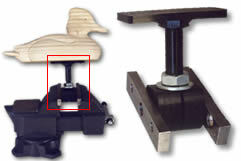 The screw holes on your vise should be 2 ½" on center to accept the ViceTight fixture. The holes on the ViceTight jaw plates are somewhat larger to compensate for tolerance differences on various bench vises. 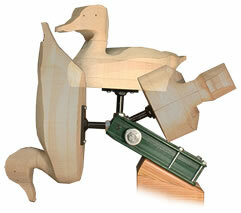 Our newest product, the ViceTight Carving Assembly has the same great features -- without using an existing vise. Both ViceTight products provide 360 degree rotation and hold your material solid. Other clamps and high end positioners do not offer the flexibility or the clean and simple operation that the ViceTight provides. And ViceTight is much less costly! Watch our newly updated ViceTight video below! A demontration of ALL of our products and new video of powertools being used with our ViceTight Assembly!